The second child under 9 years old will be considered as adult. 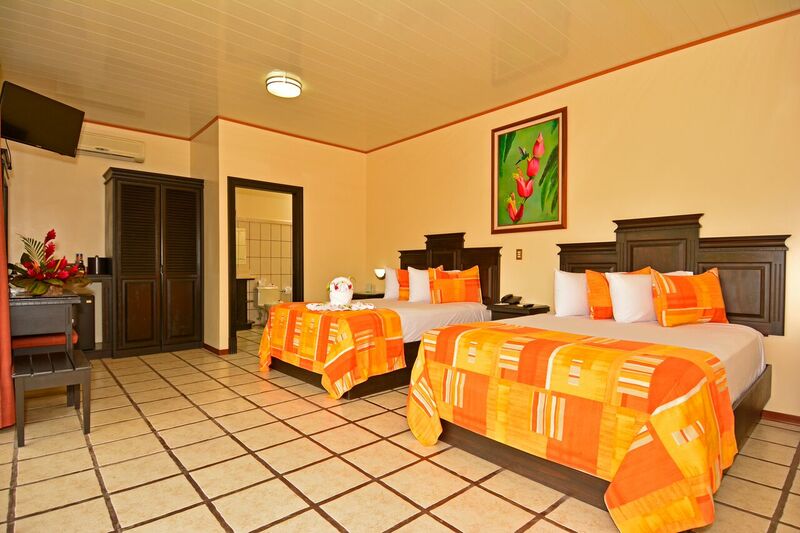 Located at just two hours and a half from San José, is Hotel Arenal Manoa, in one of the most popular tourist places for visitors, a place where you will find a huge variety of tourist attractions, as well; one of the most active volcano in the world; the Arenal Volcano. With a privileged location, we are 7 kilometers west from La Fortuna and 800 meters from the main road that made a very natural and private environment, surrounded by the La Palma River, that go around the hotel making an ideal refuge for the great diversity of birds, some mammals and lizards, besides a large variety of plants. 1. San José – San Ramón – Arenal Manoa: It's the fastest access route, surrounded of green areas and beautiful forest scenarios, takes 2 hour and a half approximately. 2. San José – Ciudad Quesada – Arenal Manoa: It's a very colourful route, it crosses very attractive places like the central park of Zarcero, and the trip takes about three hours. 3. Liberia – Tilarán – Arenal Manoa: From the Daniel Oduber International Airport, in Liberia, the route crosses the Guanacaste dry forest, the travel spend three hours. See the Map. Arenal Manoa is a beautiful place to rest, relax and enjoy the marvelous view of the Arenal Volcano. Surrounded by gardens, pastures and animals, the rooms have been designed so that each one offers guests a panoramic view of the volcano. Visitors can take advantage of the spacious gardens for walks and meditation as well as the opportunity to see the daily operations of a typical Costa Rican farm. Junior Suites have been designed in a way that you can't fail to see any detail of the panoramic view of the Volcano from your own room. These units offer wide open internal and exterior spaces, air conditioning, two queen beds, satellite television, a parivate bath with hot water and a hair dryer, telephone, terrace, refrigerator, coffee maker and safe deposit box. Meeting Room: Conference room accommodates up to 150 people with the option to cater with coffee, breakfast, lunch, or dinner from the hotel's own fine dining restaurant. What to bring: cash, bug spray, sunscreen, sandals, hiking boots. Breakfast: American style breakfast or a breakfast buffet. Romantic dinner the first night. Arenal Volcano tour (El Silencio trail) plus entrance to Baldi Hot Springs & Dinner. One bottle of sparkling wine or cava with a basket of tropical fruits. Roses decoration, tropical flowers and rose petals all around in the room for the first night. Private massage session in our Spa.